Red Rocks Nevada: Holiday from Democracy, November 2004. 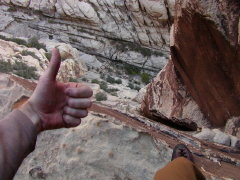 I just got back from Vegas, and had some fantastic climbing. Sandy's plan was to have a post election get away to hopefully celebrate, but if not, then to escape from reality for a few days. Unfortunately as all sensible people know, we ended up having to escape rather than celebrate. This was just a quick out and back trip, so I hired a guide from Jackson Hole Mountain guides, a company I've used on two other trips to Red Rocks. I did 2 days of climbing, and considering the length of the first climb, that was all I needed. The first climb was Epinephrine, a 10 pitch 5.9 in Black Velvet Canyon. Black Velvet Canyon is located west of the town of Blue Diamond, (not in the park loop road). Some of the other classic climbs in that canyon are Frogland and Prince of Darkness. Epinephrine was originally done in 15-18 pitches. With a 60 meter rope, it takes 10 nearly full rope length pitches for about 1800 feet of technical climbing, followed by 700 feet of easy but often very exposed scrambling (a slip could turn into a 2000' fall.. we stayed roped up) Total vertical on the climb is over 2000 feet. The route starts off with a short face climbing section leading to 4 pitches of 5.9 chimney climbing. During this section, we trailed a pack on a haul line. After 3-4 hours and 600 feet of strenuous climbing, its a little demoralizing to hear that you are only 1/3 of the way to the top. :-) The rest of the route once we got out of the chimneys went much faster, but we had to climb pretty much non-stop, eating and drinking during the gear changeovers. There were some bolts for fixed pro during the pitches, but almost every belay anchor was a good 3 bolt anchor. The route was a mix of chimneys, cracks, some off width, face climbing, and a couple roofs. The variety helped keep me from pumping out since I had to mix up the moves the whole route. After the 10 pitches of climbing, we did 3 pitches of roped up scrambling, plus some simulclimbing over easy 4th class terrain while the sun was rapidly setting. We made it to the top of the roped sections, and finally got a chance to sit down, relax, eat, and change into our approach shoes. By now it was dark, so out came the headlamps for the 2 hour descent. The descent continued up, over the summit, then down along a ridge line, joining up with the descent from Frogland. In the dark, it took us about 2:10 to get back to the car. All told, it was a 13 hour day from car to car. This was easily twice as long as any other climb I've done. My guide, Nate, led the whole route. I would have been able to lead most of the pitches taken by themselves, but there is no way that I could have done them fast enough to get up the route in 1 day, nor would I have had the endurance to lead this long of a route. I was able to keep in touch with Sandy via walkie talkie during the course of the day, and she was able to follow our progress in the descent by watching our headlamps in the distance. The walkie talkies came in handy after the police helicopter showed up, and I was able to reassure Sandy that they weren't looking for us. 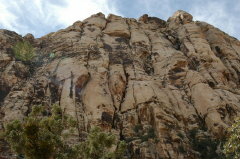 The Las Vegas Metro PD Search and Rescue helicopter must have been looking for a missing hiker or overdue climber, because they closely hugged the cliff faces and ridge lines looking for something. The pilot was amazing! 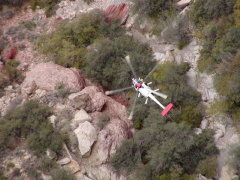 From above, it looked like the rotors were going to hit the cliff wall as he hovered. The next day we were able to sleep in a little later, and went to the White Rock area off the loop road, just past the sandstone quarry. We had planned on doing Tunnel Vision (5.7), but there was a short line, so we hopped on Group Therapy,another 5.7 (with a 5.8 variation at the end) right next to it. Group therapy has several runout areas with little pro, however having multiple large pieces makes a big difference. The plan was for me to lead most or all of the route. We climbed with multiple #4 camalots, a #5 camalot, and a big bro. There are no bolts on the climb, all belays are done with gear. The guide book shows this climb as a 6 pitch climb, but we did it in 7 since I had to stop when I knew I had enough gear left to build anchors. I led the first 5 pitches, which went at 5.6 or easier. The runout areas weren't bad because the climbing was easy. Without the extra pieces of large gear, the route would have been way too run out for my liking. The second to the last pitch started off with a roof where a fall would land you on the belayer, followed up by more offwidth crack and runouts. I was getting tired, and the day was getting a little long, so I turned the lead over to Nate and suggested the 5.8 variation at the end. The total route was around 700'. The descent wasn't too bad... it took about 40 minutes, counting 2 short rappells. We made it out of the park and back into town before sunset. 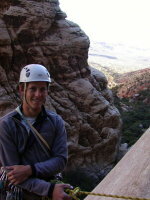 Nate is a great guy, and this made for another great experience with Jackson Hole Mountain Guides. I highly recommend them if you find yourself in Vegas without a partner. Las Vegas Metro Police Department Search and Rescue home page, including photos and incident reports. Black Velvet Canyon, home of Frogland, Prince of Darkness, Dream of Wild Turkeys, and Epinephrine. My partner, Nate, from Jackson Hole Mountain Guides Epinephrine route overview. Blue is technical climbing, green is scrambling. Dotted lines are in chimneys or behind summit. Boxes show the location of the following closeups. Out of the chimneys on top of the Elephants trunk. Last of the technical pitches. 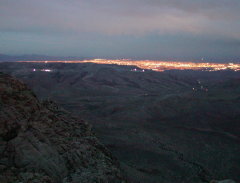 View from the summit, after dark. Angel Food Wall in White Rock. Home of Tunnel Vision and Group Therapy. Andy leading the first pitch. Finishing on the 5.8 variation at the top of Group Therapy.